Every professional golfer has their clubs custom made. The clubs may be brand name, but they are customized for a specific golfer. Most good amateurs also use some custom clubs. Building custom golf clubs is just as the name implies, “building”. During this process, we do not actually manufacture the club components, but custom assemble them from a wide selection of component choices and possible combinations. The individual golf club components are ordered from manufacturers or other sources. “Custom Builders” or “Clubmakers” are people who assemble golf club components. There are only four components that make up a golf club – club head, shaft, grip, and ferrule. NOTE: The ferrule plays no functional role in club performance. It serves as a finished appearance. We Custom Build: Irons, Woods, Hybrids, Wedges, Putters and Any Combination! Building golf clubs is not as simple as having a bench vice, hacksaw, copper pipe cutter, and a tape measure. There are many specialized tools that are required to do it properly and avoid problems. Additionally, one must possess the knowledge to do it correctly and experience to troubleshoot any issues that might arise. The largest name brand companies assemble their own clubs in the factories. As custom golf club builders at Better Golf Shot, we have many brand options and clones from which to choose. The top name-brand golf shafts, golf grips, and parts can be purchased without buying the entire club. The heads of the largest companies can not be purchased individually. However, name-brand heads that are pre-owned or demos can also be bought and utilized to customize a new or old club. This mix and match flexibility provides us with an advantage over the big retailers in terms of golfer fit. There are a great many independent component manufacturers. Furthermore, they offer a wide variety of styles in components to choose from. We can build the near perfect set of clubs for your individual golf swing and preferences. Building a set of clubs is a completely custom job. 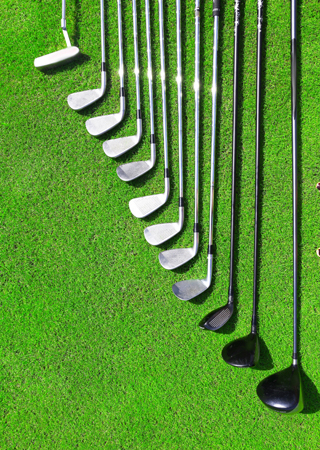 It can also be very cost-effective in relation to buying a set of clubs from a retail store. Custom club building can be for just one club or an entire set. We can build you a set of irons, woods, wedges – or top to bottom everything including putter and hybrid(s). There are two basic directions to go. 1) Starting from scratch wit h all new components (usually after an extensive fitting session), or 2) Updating, upgrading, or modification of existing clubs with one or two components. Does it make more sense to modify my existing clubs with some combination of new shafts/grips/heads? Or would starting a brand new set from scratch be the right decision? Finally, when purchasing off-the-shelf retail clubs, you are conforming to the golf club – its design, standard specs, and general characteristics. Custom built clubs conform to your swing and body type. As a golfer, you probably know how negative a change in your swing can screw up your game. Therefore, this is why you should not conform to the golf club – but have the golf club conform to you.